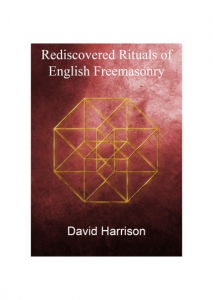 My latest book, Rediscovered Rituals of English Freemasonry, due out in the autumn, uses the tesseract symbol on the cover. There are a number of reasons why I chose this image for the new book, so I thought I would discuss the history and meaning of this highly spiritual symbol. The tesseract is a four dimensional hypercube consisting of eight cubic cells that can be unfolded to form a cross, an image that can be seen in Salvador Dali’s 1954 painting Crucifixion (Corpus Hypercubus), comparable to the way that a cube can be unfolded into six squares. The term tesseract was first used by British mathematician Charles Howard Hinton in 1888, who presented his ideas to the Washington Philosophical Society in 1902 before publishing his book The Fourth Dimension two years later. In his book, Hinton presented diagrams of cubic cells, instructing how they could be mentally assembled into a tesseract, explaining that ‘the higher world is four-dimensional’ and ‘within space are given the conceptions of point and line, line and plane, which really involve the relation of space to a higher space’.1 Thus the four dimensional tesseract is inaccessible to the mind, just like the concept of God is incomprehensible to humans, the unfolding of the tesseract into a cross allows us to comprehend a three dimensional image of it, akin to comprehending Christ as a human form of God. 1. See Charles Howard Hinton, The Fourth Dimension, (London: George Allen & Co., 1912), pp.2-3. 2. See John Belton and Simon Mayers, ‘The Life and Works of Dudley Wright’, Heredom, 23, (2015), pp.11-53. 3. See Alexander Horne, Theosophy and the Fourth Dimension, (Theosophical Press, 1928), and for an examination of the visual aspect of the tesseract in a geometrical context see John Barnes, Gems of Geometry, (London: Springer, 2012), pp.85-86.